By Fr. Michael Keiser – 104 pgs. A Beginner’s Guide to Prayer speaks to the average man or woman on the street who desires a deeper relationship with God but is unsure how or where to begin. 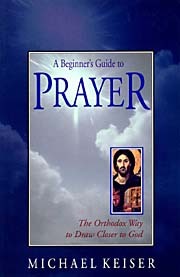 This is a book for those of us who are struggling to establish an effective prayer life. Written neither for monastics or scholars, A Beginner’s Guide to Prayer speaks to the average man or woman on the street who desires a deeper relationship with God but is unsure how or where to begin. Drawing from nearly 2000 years of Orthodox spiritual wisdom, the author offers warm, practical, pastoral advice whose genius is to be found in its homespun simplicity and straightforward style.